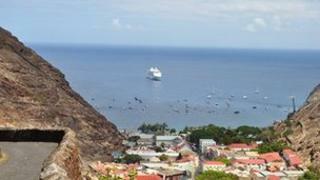 Residents on the remote South Atlantic territory of St Helena have renewed their plea for the UK to back plans to bring broadband to the island. The British Overseas Territory needs £10m to connect to a submarine cable. The island's 4,200 residents currently rely on a slow satellite connection, which campaigners say is stunting the island's growth. The Foreign Office has said a "full economic assessment" was needed before any new link could be funded. The UK, like several other countries, refused to sign a proposed UN treaty regarding wide-ranging changes to internet governance at a conference in Dubai last month. It meant a clause requiring states to aid in connecting remote communities will not now be enforced, removing any obligation or commitment for the government to work with communities such as St Helena. "The UK did not sign the revised International Telecommunication Regulations last week in Dubai, and has no intention of doing so in the future," the Foreign Office said in an email. "We will therefore not be bound by the provisions contained in the Treaty when it comes into force on 1 January 2015." Campaign group A Human Right, which is supported by the UN, has called on the Department for International Development to contribute a substantial amount to the engineering costs of connecting the island to the South Atlantic Express, a new superfast fibre optic cable being laid by South African firm eFive. Dr Rosalind Thomas, eFive's chief executive, agreed last year to alter the cable's path to bring it closer to the island, opening up the prospect of connecting it. An investment of around £10m, campaigners said, would be enough to latch on to the cable and "revolutionise" the island - with private backers contributing further costs. Due to the island's location, it is well-placed to support infrastructure relating to satellite operations, including base stations and communication hubs. The government is already spending £250m on the island to build a new airport in a bid to encourage high-spend tourism to the island which is one of the most remote on earth. "The plan [for the airport] is to establish high-spending tourism on the island which will be quite a challenge," said Christian von der Ropp, organiser of the campaign. "If you spend an additional £10m or a bit less getting this cable landed, there would be a huge opportunity for social and economic development. "This is something that would revolutionise the island, and people's perspectives there. And I believe it would relieve British taxpayers." Currently, the UK government spends £20m a year on supporting the island. In an email to A Human Right, the Foreign and Commonwealth Office said telecommunications on the island was the responsibility of the St Helena Government. "We are aware of eFive Telecom's plans to lay a fibre-optic cable connecting South Africa and Brazil and the St Helena Government's initial discussions with them about the feasibility and costs of a spur link to St Helena," the Foreign Office said. "If the developers proceed with the project then a full economic assessment would be needed to consider the extent of the economic and social benefits that such a link could bring to St Helena." Campaigners hope that with better internet access local residents, particularly young people, will be less inclined to leave the island for study and work purposes. Mike Olffon, owner of the island's radio station Saint FM, told the BBC that getting access was prohibitively expensive. "Internet here at the moment is tremendously expensive because it's satellite - it's well over £100 a month. We have no choice. "It is important for the development of the island, if we want to have IT services and internet-related business. "The population would very much look forward to the government's help to pay the money."